The 2018 Fleet Doctor bracket season kicked off yesterday, April 29th. It was a tough day of competition. We saw a blend of regular Milan Dragway bracket racers along with some different faces, but the Milan Dragway regulars took the win in every class of competition. We hope to see the different faces back shaking things up and becoming part of our group of “regulars” as the 2018 season goes on. Our S & S Customs Super Pro Motorcycles decided to join in with the Insurance Man Super Pro class for the day to have a little extra fun before their points series starts on Sunday, May 13th. 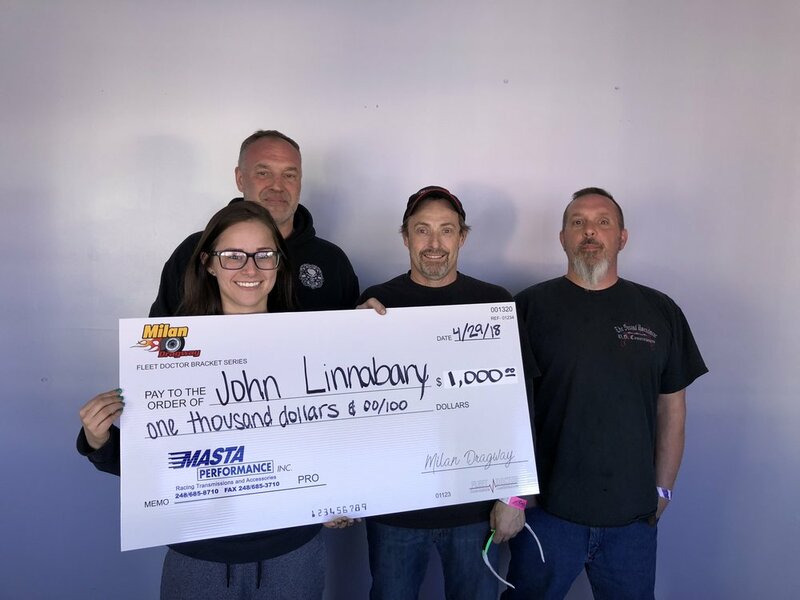 The Masta Performance Pro winner was John Linnabary from Taylor, MI after a tough start to his day. This was a great comeback for him after a tough 2017 season. Lance Provost (also from Taylor, MI) had a better start in the final round with his .009 light to Linnabary’s .019 light. Linnabary stopped the clocks at 9.234 on his 9.23 dial while Provost ran a 10.145 on his 10.11 dial. Codie Balcom from Maybee, MI was a little too eager in the final round of McCormack Racing Sportsman when he lined up next to Scott Fennell of Swanton, OH. Balcom was -0.006 red giving Fennell the automatic win. Off the starting line it was anyone’s race in Insurance Man Super Pro, Bob Payton of Fowlerville, MI had the slight reaction time advantage over Will Crawford from Westland, MI. Payton was .013 to Crawford’s .016. Down at the finish line a 6.179 on the 6.17 dial gave Will Crawford the win over Payton. 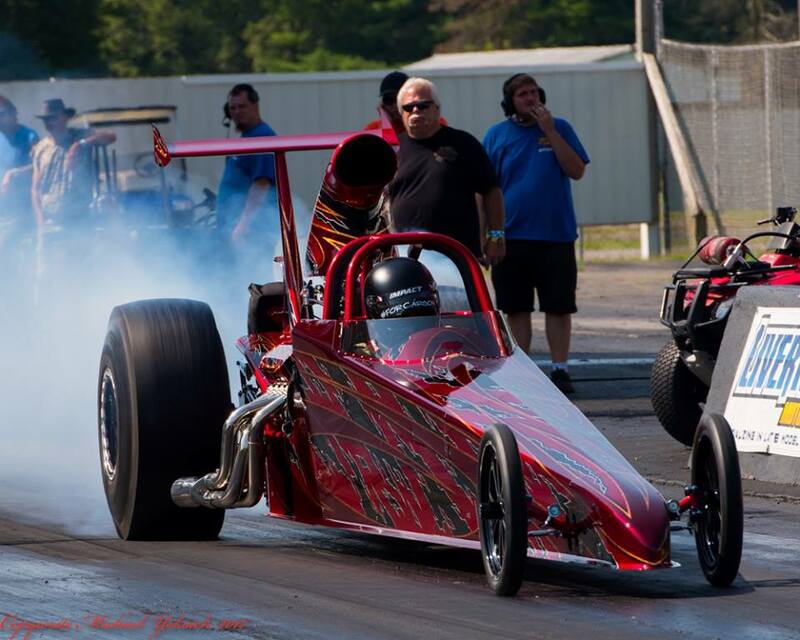 When you come to Milan Dragway on a Sunday, don’t expect to see any easy wins. These bracket racers are as tough as they come. It was an incredibly tough day of competition today for the Fleet Doctor Fall Mini Bracket Points Series Race #2. The 38 members of Team Milan were on their game as they prepare for the toughest competition of their season at Bracket Finals in Indy next weekend. The rest of our bracket racers weren’t going to let them steal all the round wins today though and were sure to keep them on their toes. In Super Pro Motorcycle, Ron Raymond raced his way to the win over Joe Novak Jr in the final round. Raymond was .004 to Novak’s .017 then ran a 8.505 on his 8.47 dial while Novak Jr ran a 8.731 on his 8.69 dial. The final round wasn’t the only place we saw tough competition as Jeff Cada and Mary Spitler didn’t make it easy for Raymond and Novak Jr to make it to the final round. Darrell Ciaravino took the win over Kevin Assad in McCormack Racing Sportsman when he was .006 off the line then ran 12.200 on his 12.16 dial. Assad wasn’t letting Ciaravino have it easy as he was .034 then ran 11.998 on his 11.97 dial. Donnie Hagar was taken down by Kevin Assad in the semi-finals while Ciaravino met up with Jeff Kulik. Cody Heidt got it done in Insurance Man Super Pro when he lined up with Dave Heller. After Heidt left the line, Heller who has been deadly on the tree this weekend went -.003 red. Heidt was ready for a race though as he left with an .017 then ran a 6.284 on his 6.28 dial. Before taking the final round win, Heidt took out Jeff Smith in the semi-final round. 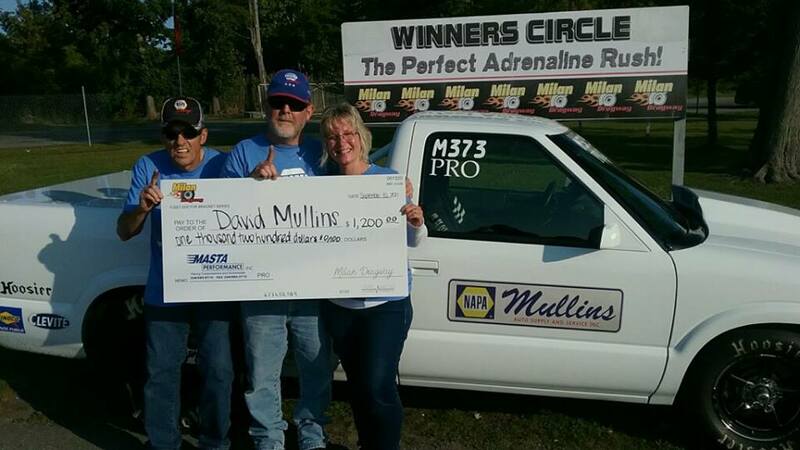 Masta Performance Pro saw David Mullins take home the win when he cut a perfect light .000 then ran a 10.391 on his 10.37 dial while Donnie Hagar went through at a 13.475 on his 13.46 dial after leaving the line with an .025. Tyler Borman and Larry Pawluck were who Mullins and Hagar had to make it past in the semi-finals. With only one race left in the Fleet Doctor Bracket Points Series, we already know who two of our champions are barring any insane (unrealistic) circumstances. So, we want to congratulate Carl Keil on winning Insurance Man Super Pro for the second year in a row and Joe Novak Sr for adding another Super Pro Motorcycle championship to his many. At Sunday, August 13th’s race, Matt Cornell took the win in Insurance Man Super Pro over the Insurance Man himself Steve Smith. A red light start for Smith gave Cornell the win. Cornell made his way to the final by beating, now, two-time class champion Carl Keil. Cornell was .007 to Keil’s .015. Then ran a 6.575 on his 6.57 dial while Keil ran 4.947 on his 4.94. Uncharacteristic first round losses for the 2-4th place points members paved the way for Keil’s championship, though, he still had to put in work to take advantage of that opening. Joe Novak Sr. took the win against Bill Stetz in the Super Pro Motorcycle final. An .046 for Novak to Stetz’s .058 helped Novak off the line then he ran a 8.412 on his 8.39 dial while Stetz finished by breaking out by .005. Ron Raymond locked himself in at a second place points finish by making it to the semi-finals in Sunday’s race. Dustin Loynes, whose wife and daughter proved to be his good luck charms, took the win in Masta Performance Pro over AJ Owen. Loynes’ .007 light set him up for success as Owen left with a .031. We saw AJ breakout running a 10.594 on his 10.62 dial while Loynes went through at 9.717 on his 9.67. Loynes best package of the day was against Warren Smith in the semi-finals when he was .004 and ran dead on with a 0 for a .004 package. He needed it as Smith was no duck with his .009 light and running 8.828 on his 8.82 dial. Bill Morand took out Johnnie Cook in the final round of McCormack Racing Sportsman. The runner up finish did put Johnnie Cook within reach of the championship though. Morand was .033 to Cook’s .060 to earn the win over Cook on a double breakout. Looking at the points standing for Sportsman and Pro is interesting as we have one person who could very realistically become champion in BOTH classes. Aside from Greg McCurry being within reach of both of these, we have two other drivers (Marlon Howes and Johnnie Cook) who it would take a little more luck, fate, and work but are still in the running for both. The final Fleet Doctor Bracket Points Race is this upcoming Sunday, August 20th, we are very excited to watch the race play out and see who will become our Masta Performance Pro Champion and McCormack Racing Sportsman Champion, as well as, name our team for the NHRA Division 3 Bracket Finals team in September.